At Cuddington Croft, a major strand of our school development plan focuses on innovation in teaching and learning, and the way in which we use our learning environment is a key element of this. Two particular issues – finance and the learning environment – were key drivers in our joining the “smarter spaces” project with SSAT and Dulux, as we are constantly looking for ways to develop and enhance our provision, but within the constraints of our budget. Learning space is at a premium in our school so, as part of the leadership team, I am constantly looking for innovative ways in which we can develop the limited spaces we have available. Following a visit to an outstanding local primary school, I was inspired to rethink our approach to the conventional concept of a learning environment and ways in which our teachers can support challenge and progress within our pupils’ learning. Cuddington Croft is a mixed two-form entry school and nursery catering for 3 to 11-year-olds, with around 500 children on roll. It is a converter academy within the GLF Schools multi-academy trust. Progress and attainment scores are above local and national averages, and percentage attendance is above the national average. The school was graded “good” in the most recent Ofsted inspection (September 2017). The objectives for developing the smarter space in school were two-fold: to redesign a disused corridor space so that it could function effectively as a break-out learning environment, and to work alongside teachers and pupils to identify ways in which the new space could lead to outstanding teaching and learning. Working with the smarter spaces project allowed me to develop my own understanding of educational environment design. The professional development offered by the SSAT Lead Practitioner accreditation process would also help us to benefit from the design expertise. Previous work carried out to make better use of other areas within our school has focused on creating break-out spaces which can accommodate a range of users and be manipulated by teaching staff and pupils to suit their needs. This project focused on developing a “smarter space” by transforming a dark corridor into a challenging new learning environment. The design and implementation of the project was driven by key considerations: enhancing the teaching and learning environment, inspiring engagement, encouraging positive attitude and behaviour, promoting personal development and wellbeing, and helping improve building function. A key driver was the direct involvement of the pupils who would be using the space. A combination of a focus group, individual pupils, whole classes and their teachers, and the school council were involved at all stages through the design and implementation. During the design process, time and budget constraints forced us to reconsider and redraft our ideas several times in order to reach an achievable resolution for the project. However, this has proven to be a learning process, highlighting the need for resourcefulness and further reinforcing that simplicity and functionality are key criteria. In addition to working alongside individual teachers, I led CPD sessions and ran pupil focus groups to share the design theory and the resulting vision, key elements of which were to engage children more in leading their own learning, and to give staff greater impetus to encourage this and increase pupil challenge levels. 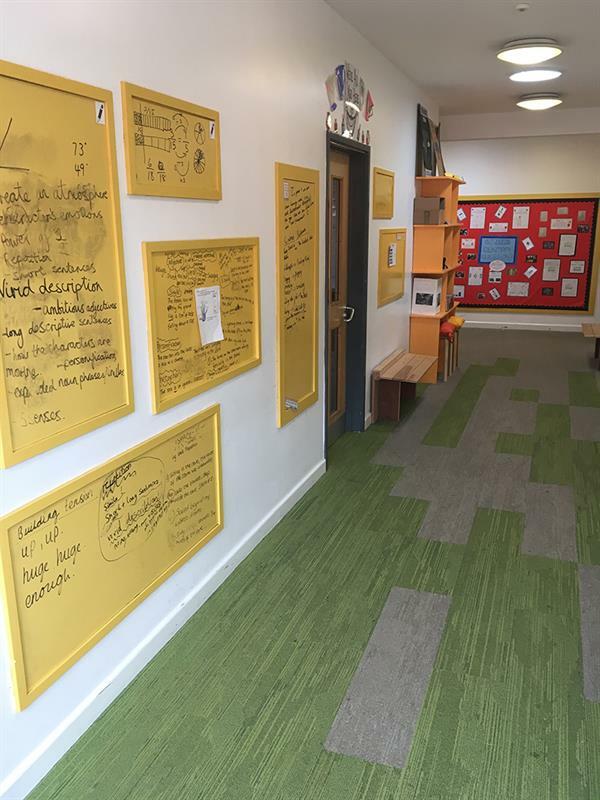 Pupils decide what is displayed in their learning environment through the writeable surfaces on the walls (this means that the displays are relevant and celebrate the journey of their learning and achievements). Pupils are trusted to independently lead their learning by using the space without adult supervision during a lesson. Misconceptions can be addressed and adjustments made to learning at a highly individualised level by using the break-out space to withdraw focused groups of pupils during the course of a lesson, by either the teaching assistant or teacher. Both teachers and pupils are continuing to lead developments in teaching and learning through their own innovation, with this practice being shared by a wider network of groups across the school. For example, moderation sessions within and across year groups share examples of learning outcomes when using this space; “best practice” photographs of learning environments around the school have been collated by the senior leadership team and shared among teachers; observations of teaching in this space have been made by senior teachers, student teachers and teaching assistants, among others. Informal and formal observations of teaching and learning have documented this success. In addition, impact on a wider learning community has developed in several different ways. The inclusion leader, the headteacher and I identified an opportunity and made a successful application for the school to participate in a research project entitled Maximising the Impact of Teaching Assistants (MITA), in conjunction with SSAT and the Education Endowment Foundation. Through this, a project focus group is working to identify how best practice can be developed alongside a set of standards and assessment criteria for teaching assistants. The creative and flexible use of the learning environment plays a key role within this. I have also set up a network for HLTAs across a partnership of local schools to share the good practice identified in both the smarter spaces and MITA research projects. The initial design concept has had to be adapted as, through use, problems were identified with some of the components and ways sought to rectify them. The writeable wall panels themselves (pictured, left) were one of the most significant challenges of the project, both in terms of physically creating them and through the way in which they were used. The initial experimental paint product supplied did not work out as it was designed to – after significant use the surfaces did not clean up to the desired standard, which caused frustration and a lack of faith in the new concept. However, the problem was sorted through a slightly different solution and now the panels work well. The initial design was for them to be used by pupils as a way of displaying their learning and engaging with their peers, e.g. by inviting responses to a question. However, teachers and teaching assistants soon found that this limited the availability of the space when they wanted to use them for modelling or focused teaching activities (they wanted to respect the children’s boards and not rub off what they had created). A compromise was therefore reached where each class had one pupil-led board (sharing the learning which was currently taking place in that classroom), with the other panels being left free for use during lessons as and when, and by whomever the staff decided. Preserving the space as a learning environment requires keeping it tidy and clutter free – a constant concern in a busy school. I have sought to address this through handing ownership of the space back to its users and encouraging teachers to maintain expectations that pupils take responsibility for caring for their learning space. Additional storage spaces have also since been created by repurposing underutilised areas in the school, and housing curriculum supplies away from the learning space. In the broader context of the project, we have needed to remain mindful that the objectives would support rather than add to other key priorities in our school development plan. To achieve this and ensure a focused approach, I worked alongside two other Lead Practitioner colleagues to develop links between my practice and the research they were undertaking on growth mindset and lesson design. Our combined research, CPD delivery and coaching have contributed to developing practice. Alice Cunningham is deputy headteacher at Cuddington Croft Primary School in Surrey.